InstaKey® Security Systems recently announced the promotion of Cita Doyle, LPQ, to vice president of sales and marketing, national accounts. Since joining InstaKey Security Systems in 2001, Doyle has been essential to the company’s growth and success. From beginning as a Western sales manager to becoming the director of sales and marketing, she truly has demonstrated a passion for the brand and a drive to deliver excellence for InstaKey’s clients. 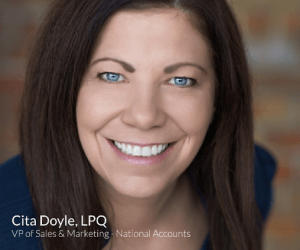 In her new role, Doyle will use her in-depth knowledge of the industry and offerings to grow and develop national accounts. With a solution-focused approach and collaborate style, she has become a recognized trusted partner and leader in the industry. “We are very pleased to make this announcement. Cita is a valued partner and colleague. Her focus and persistence, proven industry knowledge, and extensive experience will continue helping us expand our reach and create more value for our clients”, said Ryan Carter, chief executive officer. Please join InstaKey in extending a congratulations to the new VP of sales and marketing—national accounts.